To test the programming, we simulate the program in ISIS, as can be seen in the following figure. In addition, we have an LCD display to display data (duty cycle corresponding to the PWM at 32Khz, motor current, motor voltage, action on the pushbuttons, 4 push buttons are used. BP1 to manually increment the duty cycle, BP2 decrement it. BP3 set the duty cycle to 0, corresponding to the brake contact. But all these chopper shields measure the current internally but there is no current limitation. In order to have a current limitation, an analog current loop is required using specialized AOP or IC or a fast digital current loop. But what should be the value of the limitation current? The choice of the current value is normally for the 1-hour operation service in order to be able to carry out relatively long climbs without reaching the critical temperature of the engine. In addition, the power transistor of the chopper can only support 50A in our case. But in open loop, it has no current regulation, so as not to exceed the maximum current, a ramp of the duty cycle will be used. A 0.1 second interruption routine will be used to measure the voltage of the current (sample measurement, sample). This sampling time is arbitrary but does not allow to be faster than the rise time of the current because the electric time constant of the motor is L / R = 1.5 ms.
Open loop operation with a 25.5s (8bit) ramp and 0.1s interrupt routine provides a good understanding of the operation of a DC motor drive. The display will only be done every 0.2s to have a stability of the digits on the screen. In addition, a digital filtering will be done on the current and the voltage on 4 values therefore on 0.4s. The interrupt routine lasts only 250 microseconds, the loop of the main program which scans the action of push buttons is 13micros and the display time of all data is 11ms. Thus, it is possible to improve the sampling period and thus the speed of the regulation of the current. 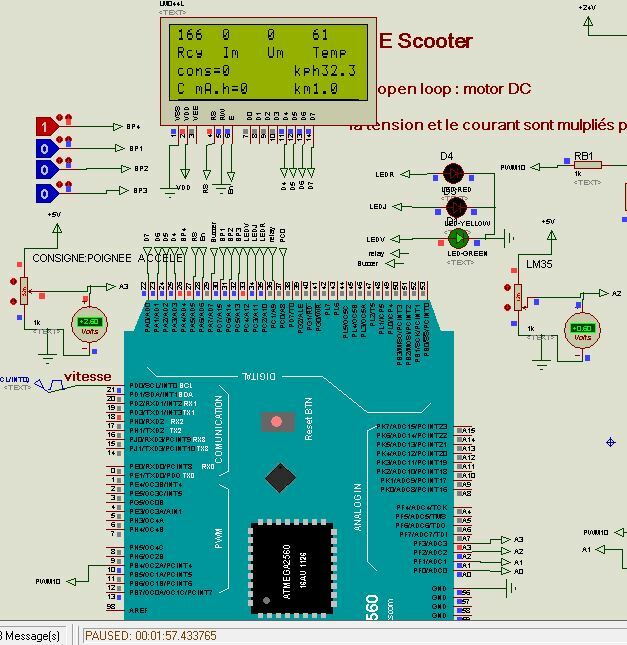 The Arduino makes it possible to make the instrumentation of the scooter so to know the power, the consumption in Ah and Wh, to measure the speed, to know the consumption according to Wh / km, to measure the temperature of the engine, Have a safe operation. If the current is less than the desired value, then the duty cycle can be increased or decreased to the desired value which is the setpoint. On the other hand, if the motor current is greater than the limiting value, there is a rapid decrease in the duty cycle. So as not to exceed the value of the duty cycle if it is saturated to 254 maximum and to the minimum value 6. An acceleration handle provides a 0.8V voltage when not operated and a 4.5V voltage when the handle is fully engaged. In addition, thermal safety by measuring the motor current will be added. If the limitation current is greater than 10s then the motor will no longer be powered for 30s. A "secu" display will appear on the LCD display. 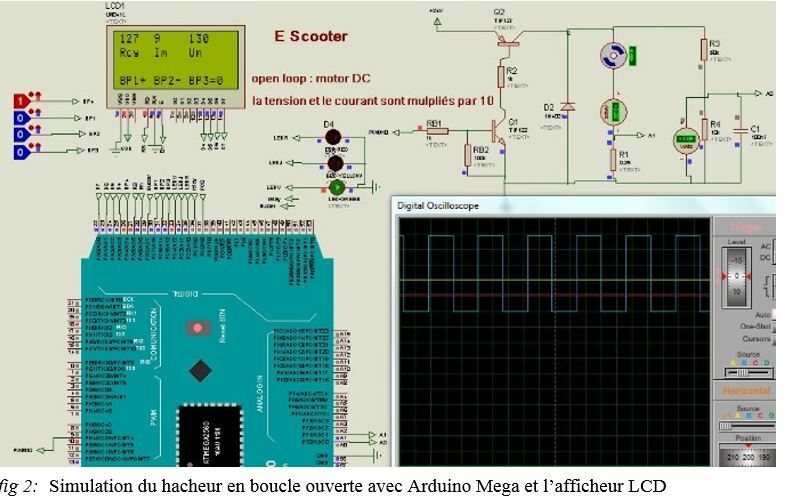 Thermal safety by measuring the motor current (digital thermal relay) which allows to know the image of the internal temperature of the engine would be ideal. But for this, it is necessary to know well the thermal modeling of the motor. The energy capacity of a battery is in A.H, we will display the value in mA.H to have a high accuracy. The capacity will be in A.Second in the following equation. So to have in mA.H, it will be divided by capacity by3600. Modeling helps to understand the vehicle and its control. 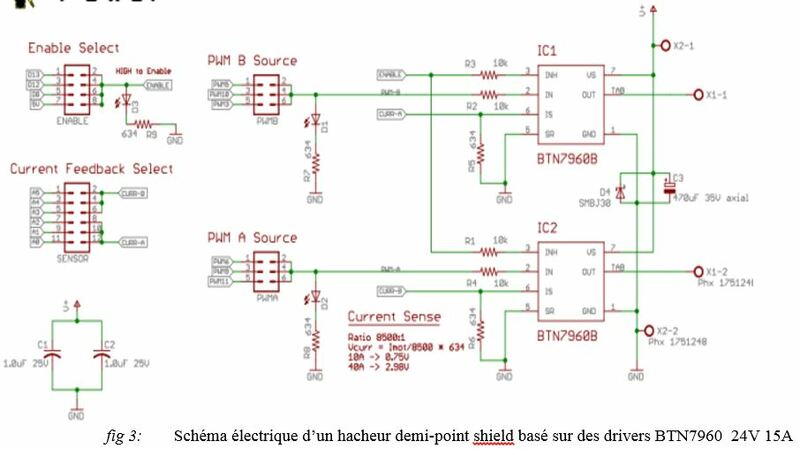 In addition, it is possible to compile the control part directly into the Arduino program from simulation under Simulink. 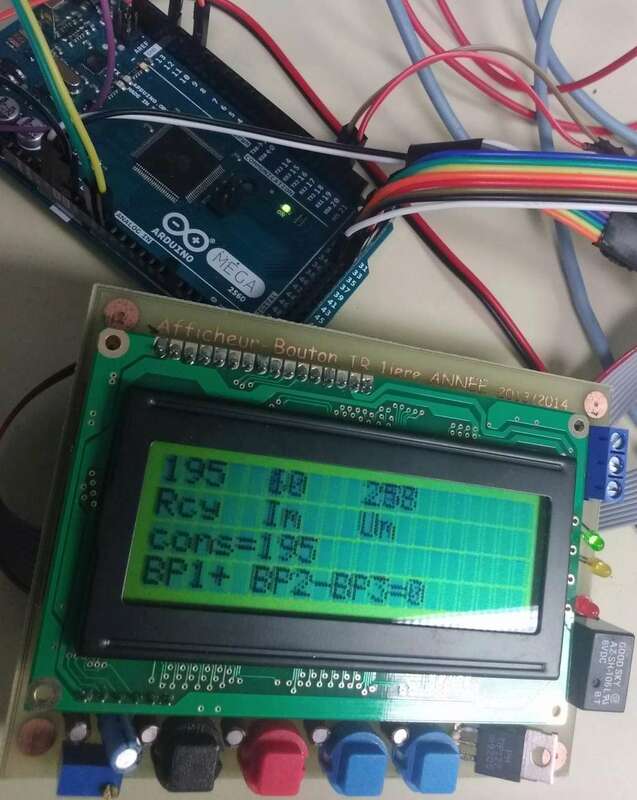 But it will not be possible to simulate the instrumentation with the LCD display. 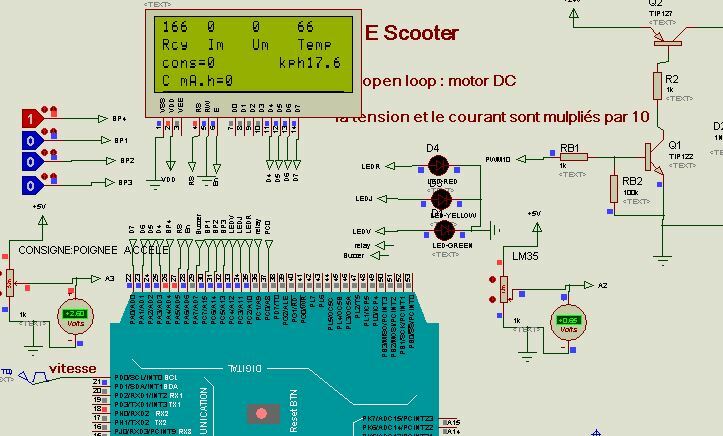 In the following figure, we can observe the simulation of the programming of the chopper with the current limitation with Simulink. In the following figure, the green box shows the duty cycle control to vary the speed and the red border the current limitation. The controller of the control is here a simple integrator but it is possible to carry out a multitude of control. In the previous figure, it can be observed that the current is well limited to 25A from 2s to 9.5s. Then, the current reaches 10.8A under established speed regime at 22.5km / h. The dynamics are similar to the tests carried out. With a slope of 5%, the cyclic ratio reaches only 100% as can be seen in the following figure. The speed will reach painfully 19km / h with a current of 24A and a motor power of 580W. So repair many scooters that are in DC motors. The display of the speed, the distance, the operating time to know the Watt.km / km can also be realized with a menu 2. But it is not possible to put an attached file in ISIS electronic labcenter? To have the speed, it is enough just to divide the number of turn of wheel on an arbitrary time of 1s to have a minimum speed of 0.81m / s therefore of 2.93 km / h. In addition, an average filter with 3 values will be used to display the speed. At 25km / h, there will be 8.5 laps. To count the turns, an external interrupt routine will be used on input INT0 21 of the mega card. To simulate the speed, a pulse on input 21 will be used with a duty cycle of 10%. To improve the accuracy of the velocity measurement, it is possible that the sampling time of the velocity measurement is dependent on the velocity. For speeds less than 10km / h sample at 1second, but above 10km / h sample at 2 seconds. The distance corresponds to the total number of turns of the wheel multiplied by the perimeter of the wheel. So do not set the number of turns to 0 for each sample. 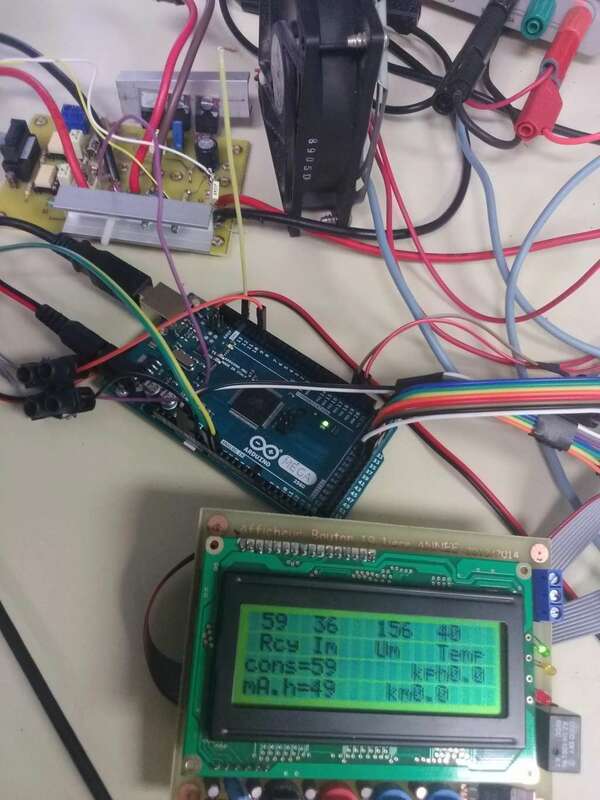 On the other hand, the reset of the distance will be done when pressing the reset of the Arduino Mega. The distance display will be displayed to the nearest second. The RAM space is used only at 4% and ROM space at 3%, for an Arduino mega. So we could take an arduino a little smaller. But, there are 8 Lipo cells to make the 24V power supply to power the engine via the chopper. Therefore, the voltage measurement of each element will be on the Arduino with a JST connector. This measurement makes it possible to know if a cell with an internal resistance which begins to pose a problem and to know if the balancing of each cell has indeed been carried out. It is possible to send all data to a smartphone via Bluetooth HC06 via pins 20, 21, RX1 and TX1. But the application under android realized under JAVA Studio can not be shared on this forum. This part will not be explained.